Former Bharatiya Janata Party (BJP) leaders Yashwant Sinha and Arun Shourie along with advocate-activist Prashant Bhushan on Tuesday accused Prime Minister Narendra Modi of violating the Defence Procurement Procedures (DPP) while finalising the high-profile Rafale deal. 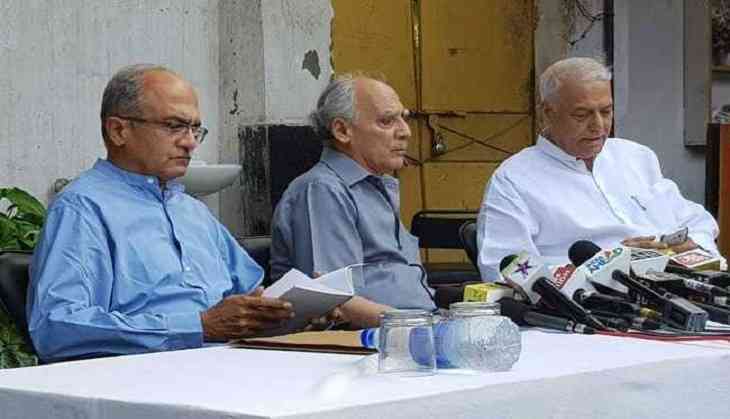 Alleging Prime Narendra Modi's "personal culpability" in the Rafale jet purchases, the trio asserted that the former bypassed every rule of defence procurement and "compromised national security". "National security has been compromised by the Prime Minister and every rule of the defence procurement was flouted to unilaterally reduce the number of planes from 126 to 36. As per DPP, only the service headquarters can decide on the numbers," said Shourie, while addressing a press conference here. Shourie said that in just two days Prime Minister Modi "completely overturned" a process that was in progress for years, while adding that the latter had "absolutely no authority to do so." He further alleged that the Central government had "spun a web of lies to protect Prime Minister's culpability in the connection". Echoing similar sentiments, Bhushan further underscored that the government is also forcing the serving officials of the Indian Air Force to defend the purchase of Rafale fighter jets. The leaders even questioned the decision of choosing Reliance Defence Ltd, which has "no experience" in manufacturing aircraft over Hindustan Aeronautics Limited (HAL). Initially in 2012, during the United Progressive Alliance's (UPA) tenure, India planned to buy 18 off-the-shelf jets from France, with 108 others to be assembled in the country by the state-run aerospace and defence company HAL. Jagga Jasoos to release in 2017. What does Ae Dil Hai Mushkil have to do with it?